Yesterday was the first Erith Pier Festival, which took place from 11am until 9pm on Erith Pier. 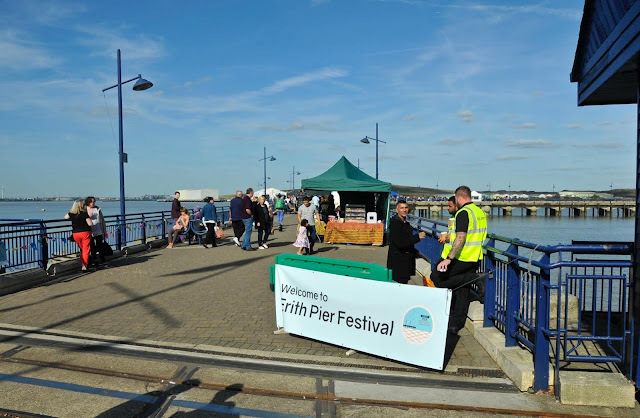 The event was very well attended both by local residents and people from further afield. Food stalls selling ice cream, American BBQ, African food, made on request gourmet pizzas, and a large pop - up pub by Bexley Brewery (the large white tent that you can see in the middle photograph above - click on any one for a larger view) were on hand to feed and provide drink for visitors. Other stands were manned by the RNLI, and there were a number of musicians on hand playing music to the crowd throughout the day. 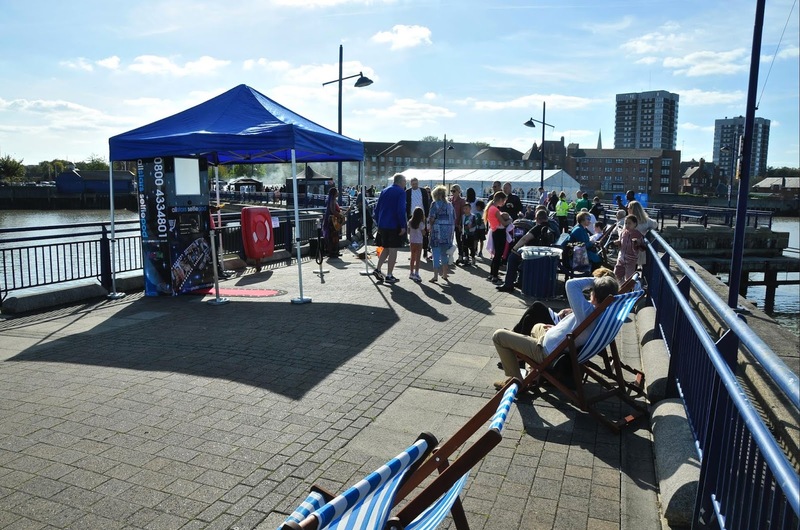 The event was very well run, and seemed to be very popular with those that attended. The weather was excellent for the time of year, and I don't think anything could have been done any better. I would have liked to stay for longer than the hour or so that I spent at the event, but I had to leave to attend the Friends of Christ Church Erith annual quiz night and raffle, which was a massive success. The final attendance figures and amount raised by the evening event have not yet been released, but I would estimate it might well exceed that of last year. 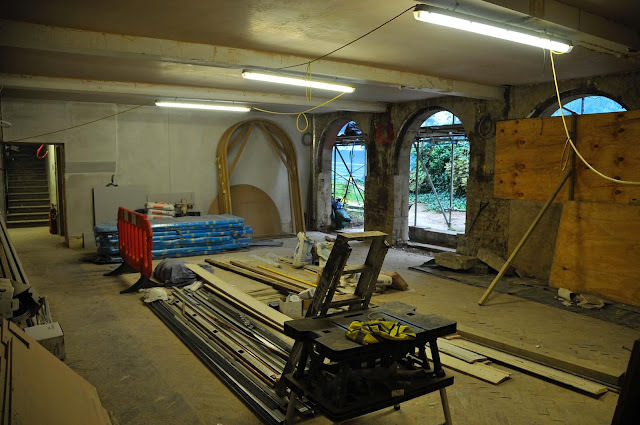 The money raised is going towards getting a tea / coffee station and a couple of toilets installed inside the listed church building, though this project may take some time to complete, due to the complexity of the work involved. An update on this will be published in a future edition. The transportation company behind the recently launched (and misleadingly named) Nuxley Navigator private mini bus service is in some pretty hot water at present. I was sent some information by an anonymous source, which was subsequently backed up by a report in the News Shopper. Chariot, a subsidiary of Ford, operates two private mini bus routes – one from Erith to Abbey Wood station and another along Shooters Hill to North Greenwich. The route from Erith Quarry to Abbey Wood station is a bit redundant at present, as it is designed to carry passengers from the forthcoming Erith Quarry housing development to the Elizabeth Line terminus at Abbey Wood. As has been widely reported in the mainstream press, the Elizabeth Line opening has been delayed for at least a year, and quite possibly somewhat longer. The Erith Quarry site is also not actually open for residents yet, although phase one of the development should be opens quite some time sooner than the railway. It has been reported that the the Shooters Hill to North Greenwich mini bus service is in trouble, in the words of the News Shopper "after a shuttle bus driver was investigated for allegedly having a poo on the side of the road". The paper then also reported:- "Ford has been forced to apologise after one of its Chariot drivers was caught “defecating” along his route. Complaints were made on social media, and the allegation was raised during a Twitter question-and-answer service with Greenwich cabinet member Chris Kirby last week. The councillor was asked: “Any luck with Chariot regarding drivers defecating on the side of the road?” Cllr Kirby replied the situation was “deeply frustrating”, adding the council had a lot of information from residents". It is my understanding that Greenwich Council are far from pleased with Chariot, or their parent company Ford. If Greenwich Council were to terminate the contract for the Shooters Hill route, it would quite likely make the Erith to Abbey Wood route uneconomic - especially as the poorly named Nuxley Navigator route would not be coming up to full capacity for another year or so. I know that the developers of the Erith Quarry site are very keen on the Erith to Abbey Wood mini bus route, as it is one of their selling points to potential customers of their houses, many of whom will need to commute to and from London for work. What do you think? Leave a comment below, or alternatively please Email me at hugh.neal@gmail.com. Last weekend the Carnegie Library in Walnut Tree Road, Erith was open to the public, so that local residents could see the work that has been carried out on the Grade II listed building to convert it from a library and into a community centre, maker space and cafe / bar. Phase one of the restoration work has concentrated on making the building weather tight - when the former library was first opened to the public over a year ago, there was rainwater running down the interior walls, and trees were growing inside the building - the place had been dreadfully neglected for the best part of a decade. Now the building has a brand new (and very expensive) roof, and the building is now sealed from the elements. 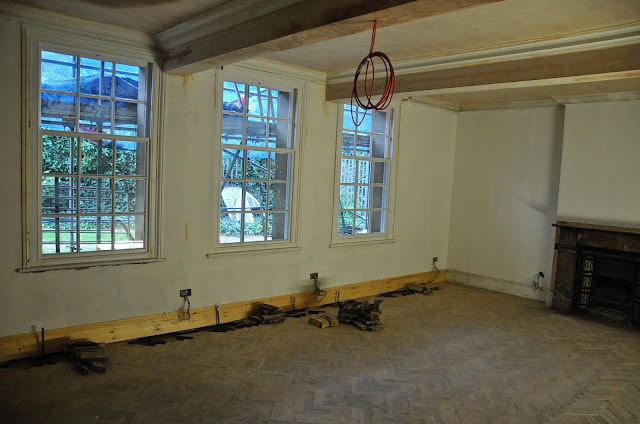 The interior used to have a very strong musty smell due to the extensive damp. Now the interior plaster has been removed from the walls to expose the local yellow brick beneath, which has enabled the building to begin drying out, now that the new roof is in place. The Architect told me that the drying out process could take up to two years, even allowing for the heat wave we had earlier this year. 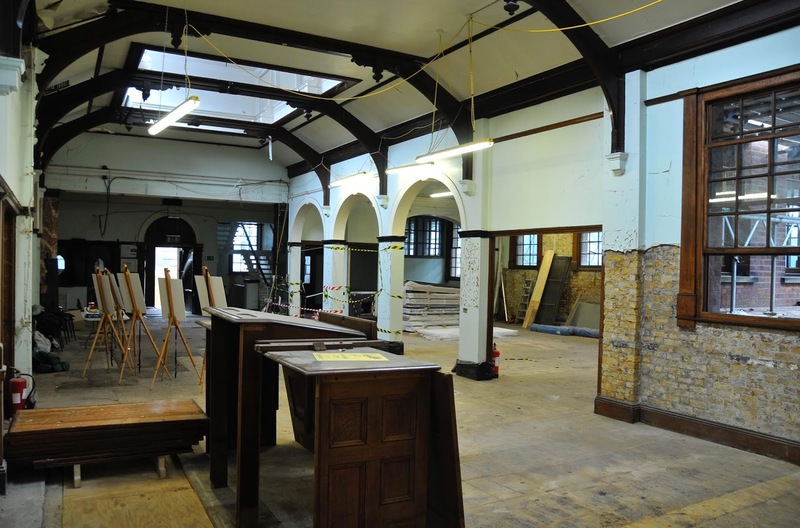 There have been a number of challenges in restoring the former library, not least in making the building buggy and wheelchair accessible. The first phase of the refurbishment is scheduled to be completed in January 2019, when it is anticipated that the lower ground floor will be opened to the public. A meeting space, a cafe / bar and associated kitchen will be the first parts of the building which will be available for public use. The ground and upper floors will be refurbished as phase two of the reconstruction, which will require additional funds, which are currently being sought. The funding so far has been sourced by the Mayor of London's Fund, and the National Lottery Fund, amongst other smaller donors. The building will be operated by The Exchange, on a very long lease from Bexley Council. You can read more about The Exchange by clicking here. Now an appeal for help and information. Roy Hillman of Saint Augustine's Church in Slade Green has asked for the following assistance:- "We're looking to make a special something of Remembrance Sunday this year as it's 100 years since the end of WW1. We're planning to have model poppies surrounding the War Memorial with details of the 59 men whose names are on the Memorial in relation to WW1 (where we have them, the address in Slade Green they lived at or were connected to, age, regiment or boat, occupation before the war). We've come across is three names NOT on the memorial but appear on information Bexley has collated. Best guess is the reason is because they are on Christ Church Erith's memorial. So - submariner C E Spells of 58 Boundary Street. (HMS E49, which was lost near Shetland following an explosion caused by a mine). Thomas William Parmenter of 58 Arthur Street. Albert Edward Coutts (who only moved to Slade Green a year before his death, so if no local memorial perhaps there's one in Horley where he came from). Secondly, we have a number of names that we have no detail on except the initials and surname on the Memorial - Does any Blog reader know the names of :- E Anslow; J Clayton; T Clifton; W H Eden; W H Judd; W F Ottaway; A H Smith. Any help with these would be greatly appreciated. Thirdly, again looking for local 'help'. Three names where we have an element of uncertainty:- There's a W R Goodwin on the memorial, and the only matching record we can find is William Rippin Goodwin a Pioneer in the Royal Engineers Railway Construction Company, died 5 November 1918, buried at Abbeville Extension Cemetery in the Somme, father Thomas Henry Goodwin from Portsmouth, mother Harriet Ann Rippin from Glapthorn, Northamptonshire, baptised 30 June 1889 in Wimbledon, in 1891 family at 85 Croydon Road, Wimbledon. As you see - a lot of information - but we can't find a Slade Green link - so have we found the correct W R Goodwin? Next, George Ashdown of 13 Arthur Street, father George Ashdown, mother Alma. But we've seen two different bits of research (I think both sponsored by Bexley) matching him to two different war records - George Ashdown a Lance Corporal in the Buffs (East Kent Regiment), died 1915 - and George Ashdown a Rifleman in the King's Rifle Brigade, died 13 October 1917 and commemorated at Tyne Cot Memorial in Belgium. Lastly, L Dudley. We need to pin down which war record (of two research sponsored by Bexley has found) and also to confirm whether the Slade Green link we have found is the correct one. So, the war records are Leonard Dudley, uncertain rank, possibly Captain, in the 10th Royal Fusiliers (City of London) died 8th October 1918, buried Rocquigny - Equancourt Road British Cemetery (Somme). And Leonard Dudley a Gunner with the Royal Garrison Artillery, died 13 September 1918, buried Brookwood Military Cemetery, Surrey. There are Memorials for L Dudley at Erith St John and Crayford Manor House, and we've seen listings by Bexley that these commemorate the latter of these two soldiers. But a possible match seems to be Leonard Thomas Dudley, born 1887 in Slade Green, the son of a Mr Whiffen and his wife Eliza who later married John Dudley. They are shown in the 1911 census as being at 90 Browning Road, Manor Park, Essex. Wondering with this one if we should actually be commemorating 2 L Dudley's!" If any reader is able to offer any advice, please Email me and I will pass the information on to Roy Hillman accordingly. Thanks to the two readers who I have already contacted privately for feedback; I have passed your comments back to Roy already, and he is working with the information. 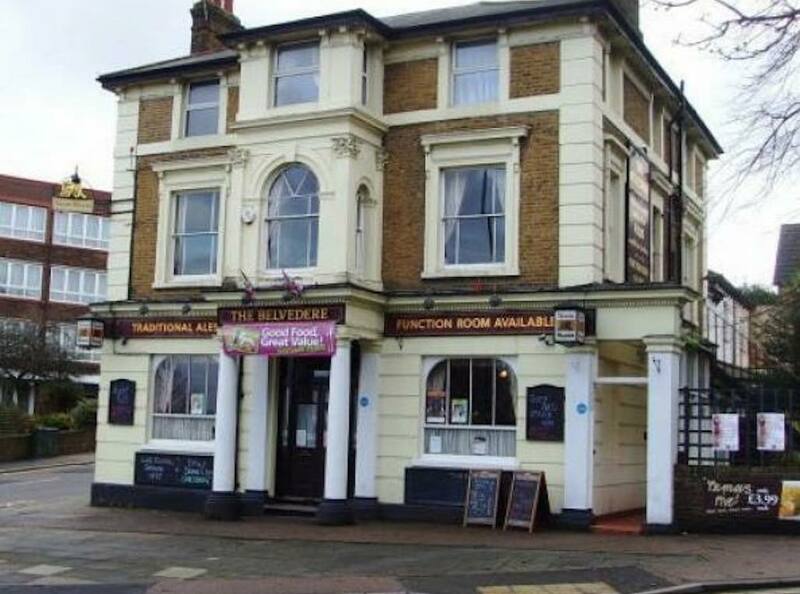 I have been informed that the historic pub, The Belvedere Hotel in Picardy Road is up for sale, and may be converted into flats. The pub has been closed to the public for some considerable time, and now it has been put up for sale. 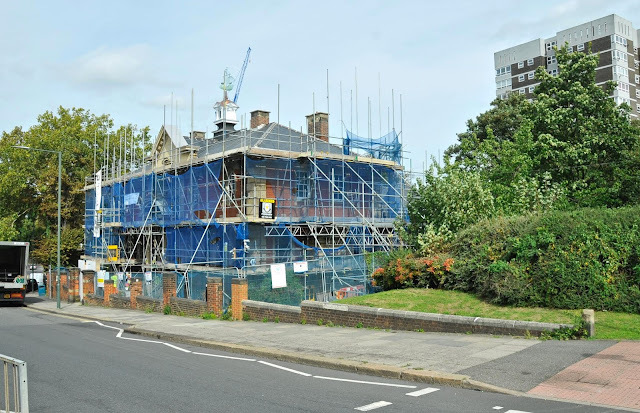 The advert reads;- "Detached public house with car parking for over ten vehicles, approximately 150 metres South of Belvedere Railway Station, which provides access to London Bridge Station with a journey time of approximately 30 minutes. Total area 0.2 of an Acre (820 square Metres). Surrounded by predominantly residential accommodation of up to four stories in height. Development / Conversion potential (subject to obtaining necessary consents)". The pub has some very historic connections, and actually has quite a grim history. Back in 1864 there were two commercial gunpowder factories – that of John Hall and Son and the Elterwater and Lowood Gunpowder company situated on the marsh land that at that time existed parallel to the River Thames between Slade Green in the East and Plumstead in the West. Both factories were physically isolated from residential areas, and many precautions were taken to prevent any kind of fire; workers had to wear felt slippers, and all equipment was made of wood, or lined with copper to prevent sparks; understandably smoking was strictly prohibited. At about 6.40 am on Saturday the first of October 1864 all these precautions proved worthless, when there was a massive explosion which totally destroyed both gunpowder factories, their store magazines and a couple of barges that were being loaded with barrels of gunpowder at the time. No contemporary account exists of exactly what caused the accident, as the eyewitnesses were instantly vaporised. The explosion was heard as far away as Cambridge, and the shock wave was so intense that people in central London were convinced that there had been an earthquake. One report at the time said that as rescuers hurried to the site they found a massive crater and absolutely no signs of any buildings were left “it was if the place had been swept clean by a broom”. Surprisingly there were only around twenty casualties, as though the explosion was huge, the remote location prevented greater loss of life. Witnesses said that a huge pall of black smoke, shaped like a mushroom hung in the air for an hour afterwards. Five of the victims were classed as “missing” as nothing remained of them to bury. Others whose bodies remained intact to some degree or other were taken to The Belvedere Hotel in Picardy Road, which was converted into a temporary morgue. The injured were taken to Guy’s Hospital at London Bridge, where some then succumbed to their injuries. The Perth Gazette and West Australian Times (the story made world headlines) also curiously reported that a man escaped serious injury, but did have “his right whisker blown off, and he has not been seen since”. The unknown reporter then comments “The damage done to property extends to a radius of over twenty miles; the effect upon domestic animals is said to have been very remarkable. Thousands of pets succumbed with fright – the mortality to Canaries being particularly great”. The army was called from the Royal Arsenal at Woolwich to assist with emergency repairs to the river wall, which had been destroyed to a length of three hundred yards from the epicentre of the blast. Fortunately the tide was low at the time, and the Royal Engineers assisted by civilian navvies and some volunteers barely managed to temporarily block the gap before the tide rose. Had they not, much of Lower Belvedere would have been flooded as later happened in 1953. Considering the size of the explosion – it is estimated that something between 45 and 100 tons of gunpowder were detonated, the long term damage was pretty light, though the superintendent of Crossness Sewage Works did put in a grumpy claim for £150 for plate glass that had been damaged by the blast – this sounds like some very creative accounting on his part, as the works was still being constructed at the time; the windows had yet to be installed, and the works did not actually go into operation until nearly a year later. It now seems that the historical link to the great tragedy that made headlines around the globe is now in danger of being lost to posterity. If you have any further information on the potential sale of The Belvedere Hotel, then please contact me in confidence at hugh.neal@gmail.com. Now for the weekly local safety and security updates from Bexley Borough Neighbourhood Watch Association. Firstly a report from Barnehurst ward:- "We have three crimes of note to report since our last update, unfortunately they are all burglaries. The first occurring at Barnehurst Golf Course from 9pm on Sunday 16th September and discovered at 6am the following morning. Suspects have forced open two large metal storage containers situated near to the club house and taken an industrial-graded grass trimmer, a petrol saw and a back pack blower from within. The next two incidents are from properties which are under renovation and both occurred overnight from Tuesday 18th September into Wednesday morning. The first occurred in Barnehurst Road where suspects have gained entry into a semi-detached house by forcing a hoarding gate lock and removing boards securing the property before taking a large petrol generator from inside. The second, entry has been gained to the rear garden of a semi-detached property in Coniston Road by suspects who have removed a temporary metal fence allowing access and then have stolen a quantity of power tools from a garage area situated at the bottom of the garden. If you see anyone acting suspiciously around properties under renovation or construction especially outside of normal working hours, please call the police immediately. Also, if you are offered cheap power tools we would like to know about it. If you have any information about these or any other crimes, call the team in strictest confidence or crime stoppers anonymously on 0800 555 111. You can also speak with a member of the policing team at Barnehurst Golf course on Wednesday 3rd October at 11am about this or any other concerns you may have about local issues. As always, you can find out about what the team have been up to by following us on twitter @MPSBarnehurst". Belvedere ward:- "Another attempted Inland Revenue Scam. We have just had a call from one of our Coordinators that lives in Belvedere Ward to say that she has a telephone call from 02380 970264 stating that she was about to receive a lawsuit from The Inland Revenue. She realised it was a scam and put the phone down. Please be alert and don't give any of your details to telephone callers. The team have returned to full strength as A/PS Green has now returned from his short time away. Recently we have recovered two dangerous items that residents have found before contacting us. The first was a machete that was found in a property that had recently been moved into. The second was an axe that had been found in the road on Brook Street. Both were safely collected and taken to Bexleyheath Police station. We have recently given information of certain offences that have been taking place at the Lesness Abbey ruins site. We are working closely with partner agencies to establish methods which will stop these offences taking place. We have also been patrolling the Nuxley Road and Lower Road areas recently after reports of begging taking place at both locations over the summer months. Last week the team dealt with a male youth that is known to the team for several incidents amounting to ASB. He had been seen in and around Nuxley Road and was returned to his school when officers were able to catch up with him. There was a burglary on Friday 21st September in Regent Square. It is suspected that residents had been observed within the days prior to this and during this burglary, a quantity of high valued gold jewellery was taken from within the family home. The team also recovered a stolen moped from Tunstock Way last weekend. The owner of the vehicle was reunited with his vehicle". Bexleyheath ward:- "We have had two burglaries reported recently. Both had accrued on the 21/09/2018 along Gravel Hill Close in a block of flats. Entry was gained via main doors to each property. If anyone does notice suspicious vehicles or suspicious behaviour, please do report to Police. 19/09/2018 – There was a report of mobile phone that was stolen from the Londis store along the Broadway Bexleyheath 26/09/2018 – Money was taken from the victim's shopping trolley along the Broadway Bexleyheath. We have also been informed that a resident had received a phone call saying they were from Hammersmith Police Station and they had found their credit card and someone was using it. Which obviously was a scam. Please be careful and mindful and report these to Police. On the Met Police website there is a PDF file that can be downloaded called the Little Book of Big Scams, if you search for it on the website it should come up. The team are still targeting patrols around Martens Grove and Grove Road including the garages to reduce anti-social behaviour. If you do wish to pass on information to Police then please contact Crime stoppers on 0800 555111. Please do not hesitate to contact us via Twitter, Facebook, email and the ward phone. If you are after crime prevention advice, please look at the Met Police website which has lots of information that you may find useful. Remember in an emergency please dial 999 and 101 for non-urgent reporting. The next Community Contact Session is on Sunday 14/10/2018 between 1030am and 1pm at Lyndhurst Church". Crayford ward:- "On Friday 21 September at 7.45am, criminal damage was caused to a Black Citroen Berlingo when, during a road rage incident, the wing mirror was punched off the vehicle. Between Thursday 20th September at 18.30 and Friday 21 September at 07.00, number plates FH55 RNJ were stolen from a White Vauxhall Vivaro whilst parked close to 1 Maiden Lane. On Sunday 23rd September at 17.00 police were called to what was believed to be a burglary at London Road. A large double glazed window had been smashed, there was no indication that the property had been entered or anything removed. On Monday 24th September there were two offences recorded at Ashurst Close. Between 10.00-16.12 an unknown person gained entry to a garden shed although nothing was taken, the garage door was also tampered with although no entry was gained. Between 17.00-20.30 the neighbouring property realised their number plates had been removed, there are no further details. On Monday 24th September during the early hours two pallets of footwear worth 5K were stolen from a lorry that was parked overnight. The driver said five white males wearing dark clothing were seen getting out of a White panel van. On Sunday 23rd September between 15.00-15.05 two iPhones were snatched from a display at Curry's by two IC1 Males aged about 25 years before running out of the store. Apple have launched the new iPhone XS, XS Max and XR, as a result there could be an increase in crime as criminals try to obtain the new phones. Please consider the following advice being given for any mobile phone or device that you may have. Be aware of your surroundings at all times and keep your personal property secure. Don't text while you are walking, you won't notice potential thieves approaching. Keep away from roadsides if your mobile is in your hand. Try going hands free or stand away from the roadside close to a wall so no one can come up behind you. Use the security features on your phone. Your phone comes with a range of security features, such as keypad locks and remote data wiping. Make sure they are all activated to stop thieves from accessing your phone and personal data. Register your phone on www.immobilise.com to help police return recovered stolen property and combat the sale of stolen goods. Police recover more than 2500 items registered to the website on average every month. Know how to identify your phone if it's stolen. Find your IMEI number by dialling *#06# from your phone and keep a written note of it. If the phone is stolen, report it to the police and your mobile provider to stop it being used. Our next ward panel is to be held on Tuesday 2nd October. If you would like to attend please email us for further details. If there is something that you consider we should pay further attention to that we could discuss at the meeting please let us know your thoughts. We have completed many hi viz patrols in the area of Biggs Hill Wood, Shenstone Park and Hall Place playing fields after reports of anti-social behaviour by off road bikes as well as foot patrols by Thames Road and smaller roads by Perry Street roundabout. Three drivers processed by our officers for using their mobile phones whilst driving, risking 6 points and a two hundred pound fine. Please don't let it be you or someone you may know". Erith ward;- "Between 2330 on Tuesday the 18th of September and 1600 on Wednesday the 19th, a burglary occurred at a lock-up in Lingfield Crescent. It appears the suspects broke off the lock and handle and removed a white Lexmoto motor cycle. Unfortunately there was no CCTV or witnesses to the incident. Also in Lingfield Crescent between the 05th and 20th of September another burglary occurred at a residential address whilst the victims were away on holiday. The suspects have entered through the rear patio doors by smashing the glass, and several items of jewellery and a tablet have been removed. Enquiries are ongoing and it may be there is CCTV at a neighbouring address. At approx 1815 on Saturday 22nd of September 2 youths were robbed in Danson Park. Investigations are ongoing in relation to this incident. A theft of motor vehicle offence was reported in which a silver Renault Laguna was taken from outside an address in Northumberland Avenue. The victim was working on his car for approx 15 minutes and went inside his home. On returning to the vehicle he noticed it had been taken. The incident occurred between 1300 and 1315 on Monday the 24th of September. Unfortunately there were no witnesses or CCTV. This coming week the team, amongst other things, will be carrying out coffee with a copper event at Subway, Bellegrove Road on Friday the 28th between 2 and 3pm and carrying out several weapons sweeps in the area - time and locations to be confirmed". Northumberland Heath ward:- "No reports of burglaries or motor vehicle crime this week. The team conducted a weapons sweep this week in the alleyway between Northumberland Park and Horsa Road. A small knife was found hidden under rubbish next to a fence. The knife is believed to have been there for some time undisturbed and not believed to be used in criminal activity. The knife has now been destroyed. On Monday this week a dog found wandering in Bexley Road was reunited with the owner having been since by officers running in and out of traffic. A happy outcome for everyone! We are receiving ongoing reports of youths gathering in and around Walsingham Walk and the alley way between Streamway and Grosvenor Road Belvedere. The youths are said to be smoking cannabis, throwing rubbish and generally causing anti- social behaviour in the area. We are patrolling this area as often as we can to help to identify and deter those responsible. One arrest this week for a male who failed to appear at court for a number of driving offences. The next Coffee With Cops event will be held on Tuesday October 2nd at Noon in the Sunshine Café in Parsonage Manorway. All are welcome to attend". Slade Green and Northend ward:- "This week starts with the bad news of 2 reported burglaries in the ward. The first was in a flat in Frobisher Road where the tenant was admitted to hospital at the start of the month. He is still in hospital for ongoing treatment but last Wednesday (September 19th) was allowed home to get some belongings. Upon entering his flat he realised that several items had been taken including his TV, phone and wallet. There was no sign of forced entry and sadly it seems that someone who was lodging with him has taken advantage during this time and taken his possessions. Enquiries are ongoing to try and track down this so called 'friend'. The second burglary took place between 1200pm and 5pm on Sunday 16th September in Hollywood Way. The front door was forced open and items taken included a PS4, Xbox, a Range Rover, substantial amounts of jewellery and a lot of cash. This is the second time in 16 months the same property has been broken into and the victim is looking into CCTV and other security measures via Bexley Victim Support and the Bobby Van service. 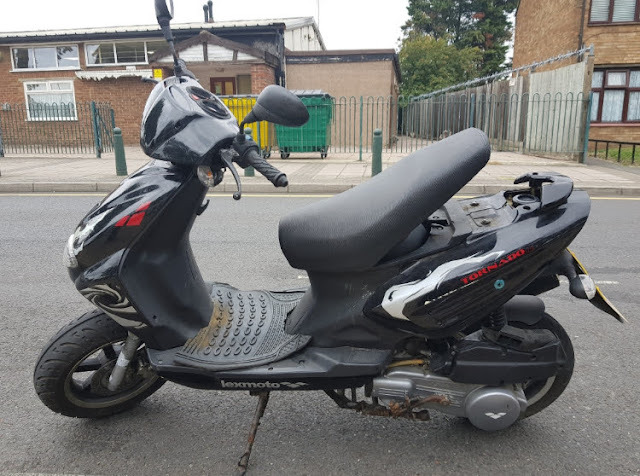 In more positive news, PC Mark and PC James seized a moped in Forest Road last Thursday afternoon (see image above) after it transpired the rider had no insurance. He didn't hang around to give any details but he won't be getting his moped back anytime soon". 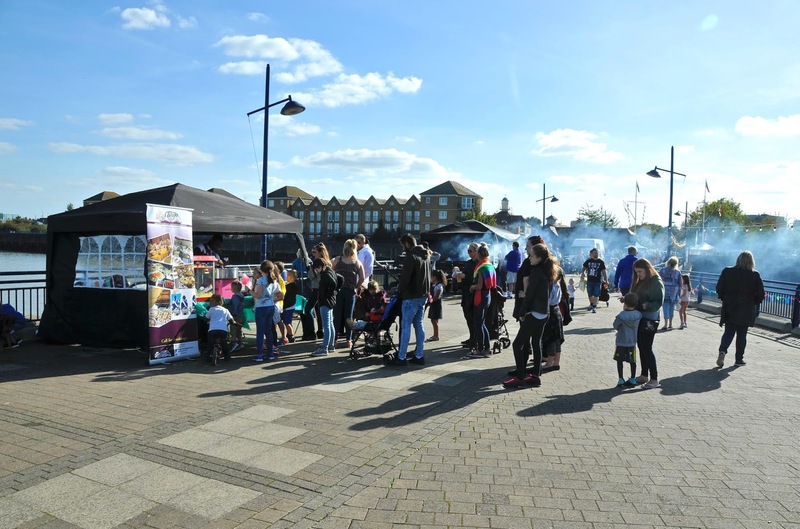 PCSO Mark Piggott of the Slade Green and Northend team also made the following announcement:- "Community Contact Sessions dates and times in the Ward for OCTOBER 2018 are listed below. THURSDAY 04/OCTOBER/2018 1200hrs FOREST ROAD CAFE. SUNDAY 14/OCTOBER/2018 1400hrs PIER ROAD SNT BASE. FRIDAY 19/OCTOBER/2018 1300hrs SLADE GREEN LIBRARY. SATURDAY 27/OCTOBER/2018 1700hrs PIER ROAD SNT BASE. If there are any issues that affect you or you have any information you feel we may need to know, please come and see us. All information is dealt with in the strictest confidence. You can also use these sessions to report crime. If you have no issues or information, come and see us anyway! Please remember our phone is only on when we are at work and is only for information purposes, so please leave a name and number if you call us and we don't answer on 0208 7212023. Alternatively we can also be reached / contacted via email on NorthendSNT@met.police.uk. You can now follow the team on Twitter @MPSNorthEndRY If you would like to become involved with Neighbourhood Watch and set up a scheme for your road (if you do not have one), please let us know. If you are unsure if you do have a scheme in your road, again, email us and we can let you know. If you need to see police always dial 101 for non emergencies and 999 for emergencies". Thamesmead East ward:- "A motor cycle which had been chained to a tree was stolen from a location in YARNTON WAY on Sunday 23/09/18 between the hours of 08:40 pm and 08:49 pm. Motor Crime Prevention - Motor Cycle owners: (1) Use disc locks to secure the front brake disc and stop it being wheeled away. (2) Use grip locks on the handlebars and always engage your steering lock. (3) lock your back wheel, with the chain off the ground to street furniture if possible.If not, thread the chain through the frame and back wheel to protect parts being stolen.thieves can easily use a hammer or angle grinder if a lock is on the ground. Find out more on improving your scooter security. Visit: www.met.police.uk/scootersecurity. 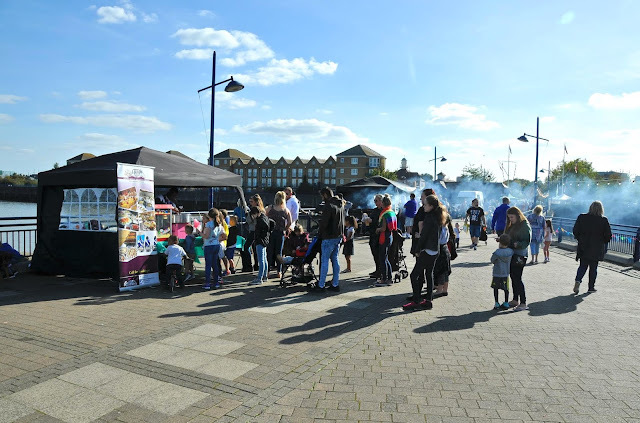 Local Event - There is a new community event every Wednesday for the over 50's between 12:00 am – 3:00pm at THE ATRIUM, TEESWATER COURT MIDDLE WAY, THAMESMEAD, DA18 4DG. Why not give it a try?" West Heath ward:- "Over the last week West Heath ward has suffered 3 thefts from and 1 theft of motor vehicles, a burglary and 2 attempted burglaries. A window was smashed and items taken from a black taxi cab in Burcharbro Road sometime between midnight and 6am on Saturday 22nd September. Two cars were broken into in Brampton Road, one sometime between 3pm on the 16th and 11pm on 17th , the car window was smashed and coat stolen. The second one happened on the 20th Sept at around 10.30pm where a van was stolen from a driveway. A car was broken into and a wallet stolen from the glove box from a driveway in Brixham Road overnight on 22nd-23rd September. The burglary was in Harvel Crescent between 5pm on the 15th and 8pm on the 19th Sept. The property was empty waiting the new residents to move in. The door was smashed to gain entry but nothing was taken. There was an attempted burglary in Pembury Road where 2 males were seen kicking a front door, entry was not gained and a another attempted burglary in Glenwiew Road where males where seen pulling on the front door. When shouted at they left in a dark blue car. Our next Community Contact Session will be in Cranbrook Road on 4th October between 12 o'clock and 1pm". The end video this week was submitted by a regular reader and occasional contributor, Miles. He captured the footage recently in Avenue Road, Erith. It shows the exploits of a couple of Bexley Council contractors, who have been tasked with safely cutting down and disposing of a roadside tree. I pass along Avenue Road twice a week whilst travelling on the B12 bus to and from Bexleyheath. On my most recent journey, which took place shortly after the video footage was shot, I saw a young couple with a baby in a buggy walking past the very location where the tree felling took place. The mind boggles as to what had happened if the couple and baby had been present when the council contractors were working - see for yourself. Leave a comment below, or alternatively Email me at hugh.neal@gmail.com.